granite. People will come from all over". "But we are hundreds of miles from any population center and not all that many people have cars". "No problem, and we are just the guys to do it". AND IT WORKED. You've got to love guys like that. As I rode today I was thinking how lucky I am. What a stunning ride. Up there with the ride yesterday, if not more spectacular. Very few people have the financial resources, health, family and work situations to be able to something like this. I am blessed. Last night we were dining at the local bowling alley and Sebastian (22 year German) says his coach wants him to do extra climbing tomorrow. The ride already has 5500 ft of climb and his add on would add 1500 ft of climb and an additional 15 miles. Two of the other serious riders agree and I keep telling myself DON'T DO IT. It is a beautiful morning and we climb through hills and grasslands to the first SAG. Guess what? I didn't do it. 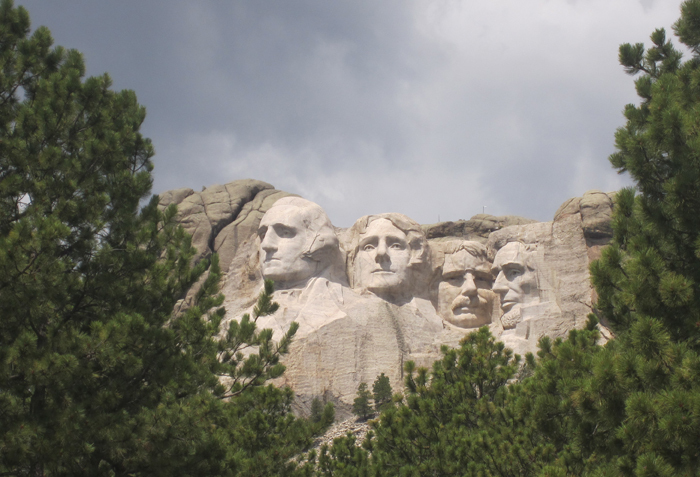 I stopped, took plenty of pictures, checked out the Crazyhorse and Mt Rushmore monuments. I did get caught in a squall that I tried to outrun about 7 miles from our hotel. As I rode through this storm I was thinking that this is a piece of cake compared to what Jim Lyle and I rode through in Erie PA.
Sebastion is an interesting young man. He will be trying to get his bike racing license when he returns to Germany. We believe this is equivalent to a Cat 1 or 2 here. When entering the bowling alley he looks at the American flags and says to me "if we did this in Germany you would think we were all Nazis". I found it interesting that he would mention the Nazis and also how our nationalism appears to some foreigners. I asked him what he found most interesting about the US. "That the hotdog eating contest (another lunatic won by eating 61 hotdogs in ten minutes) was the lead story on ESPN." He then went on to enlighten us about a sport in Bavaria where they see who can jam the most snuff into a single nostril. He says the winner looks like he has a nose goiter. At least I assume it was a male. I was just looking at the map of tomorrow's ride and noticed a marker about 60 miles north of here marking the geographic center of the US. What? That can't be right. Who decides these things anyway? Just a stunning ride today. 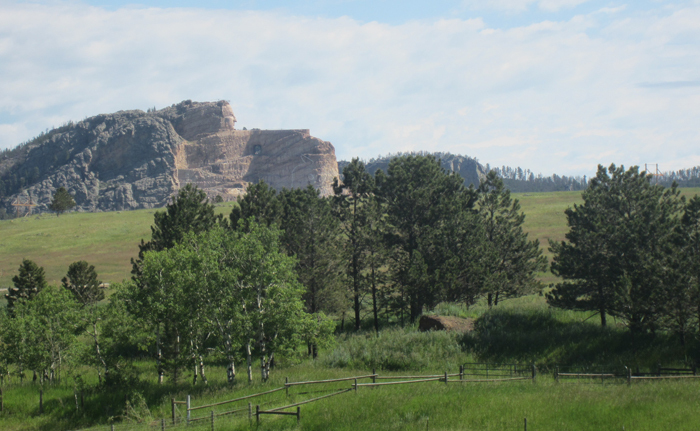 Construction of the Crazyhorse monument. 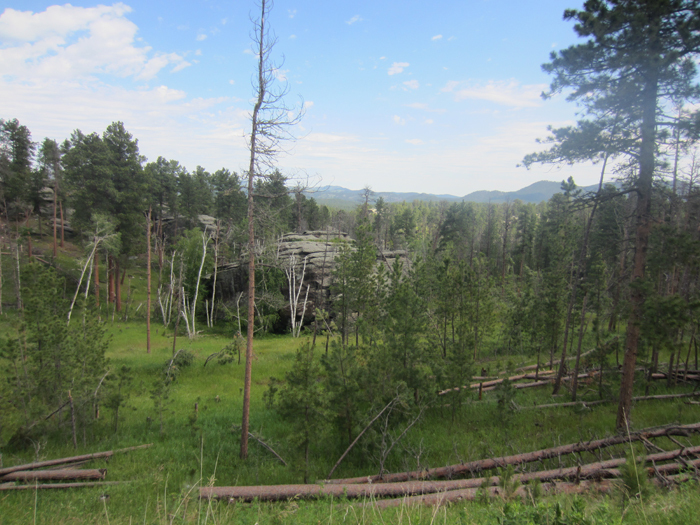 I camped for two days in the black hills and my car had some difficulty going up some of those inclines. You are crazy. I am envious. I remember Erie. We got a standing ovation from the staff when we got to the hotel. I'm surprised you didn't join Sebastian on his bonus climb. That's not the Al I know and love.